This is our last watermelon of the year. The rest of the melons on this garden space are not quite ready, and will be offered to our animals. Those unripe melons, the remaining squash and bean pods, the blistered corn cobs clinging to their stalks, and the all the green material in this garden, will be enjoyed by our chickens and porkers. We must now turn our animals into this garden to prepare the soil for a Fall planting. Three Sisters companion plantings traditionally feature corn, beans, and squash; however, a wide variety of fruits and vegetables grow well in this system, even melons. The Three Sisters garden in these pictures is a first ever planting on this patch of ground. To develop a new garden, we first prepare the area, as wild and thick as it is, with chickens and pigs. The animals eat down all the foliage, brush, weeds, and grass, and fertilize and till the soil. Next, we plant a Three Sisters garden on that space and harvest everything from it we can. Then we turn the animals back into that area to consume the remaining green material; the stems and leaves of the vegetables and the remaining produce. The animals compost the foliage, so to speak, in their bellies, and return those nutrients to the soil as powerfully good fertilizer. We develop extremely rich soil in this process, and the chicken, eggs, and pork sustained by these gardens become quite delicious. This method of heritage farming is highly efficient, cost-effective, and sustainable. Melons this late in September feel like a present, a gift of goodness among the tangled green vines. 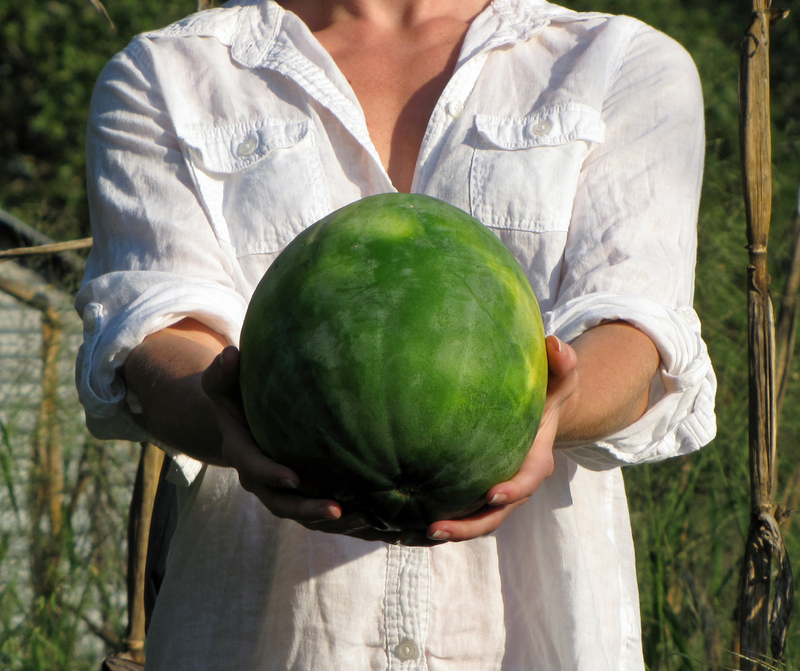 To me, they are all gifts, these black diamond watermelons that sprang from soil I knew to be wild not long ago. And this one is a last taste of sweetness, to say goodbye to summer. Awesome! It is a little difficult to sacrifice the rest of that garden to the chickens and pigs, but there will be so many good things growing in that garden again soon, we are okay with it. We will harvest those melons anyway, in the form of fried eggs and pork chops! Thanks Agi! Aww Just Great I just learn about You folks and it’s the end of the growing season. Will you be growing any kind of fall or winter garden? Yes! We are planting our Fall gardens now: lettuce, collards, carrots, parsnips, leeks, cauliflower, brocoli, turnips, onions, garlic, sugar snap peas, beets, spinach, rutabega, radishes, parsley, cilantro, and much more. Thanks so much for keeping in touch! Well let me know if you need help I have lots of time to spare and love to garden. Hi Patty! We use drip line irrigation in our gardens–definitely not soaker hoses, but commercial drip lines. They are inexpensive, last a long time, are easy to install, and are shipped right to our door. We try to water in the evening. We water deeply with each watering, until the soil is soaked to the deepest level of the roots, then let the soil drain thoroughly before the next watering. We use a lot of mulch and closely spaced plantings (to shade the soil) to minimize watering, and to keep the soil moist as possible. As our soil health improves, our gardens demand less water. Our well-established gardens require half, or even one-third, the water that our newer gardens require. That good rich soil holds the water better, and feeds the plants more efficiently. Thanks Patty!